A physician with 35 years of experience in plastic and reconstructive surgery, cosmetic surgery, and microsurgery. Extensive knowledge relative to cleft, lip, palate, and hypospadias. In addition, Dr. Castro has considerable expertise in medical training, after being clinical instructor of the Plastic Surgery Department in the University of SAn Diego, California. 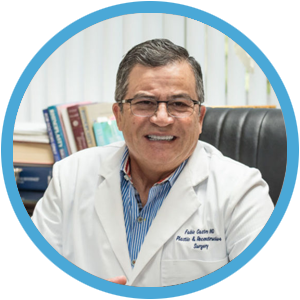 He is certified by the Mexican Board of Plastic and Reconstructive Surgery, and active member of the American Academy of Cosmetic Surgery. I have excellent communication and cross-cultural skills, speaking English and Spanish fluently.